A day split in two, from the extreme north to the extreme south of our continent, from the Arctic to Lampedusa. I just got back from the European Parliament, where together with Martin Schulz, Gianni Pittella and the Partito democratico delegation we talked about Lampedusa, its strength and its humanity. We were joined by director Gianfranco Rosi and Pietro Bartolo, a medical practitioner starring in the award-winning Fuocoammare documentary movie, which we watched together today. I had already met Rosi and the movie’s cast two weeks ago in Lampedusa. Over there I saw with my own eyes the courage of the islanders and the beauty of the island – the beauty of its places and of the people who are daily engaged in saving lives and welcoming people. I had the opportunity to verify first hand the change Lampedusa went through since my previous visits, in October 2014: back then, Italy alone was taking care for the search and rescue and for the welcoming, today our Union is finally in Lampedusa. It is a promise I had made to the island in 2014: I promised I would tell the island’s story to the whole of Europe, and to involve the whole of Europe in dealing with migrations. We are still far from a full “europeanisation” of migration and asylum policies. Still, Italy is not alone any more, as our Union is saving lives and fighting the human traffickers in the Mediterranean. This can only make us proud. This is the true Europe – one that does not pretend to close its eyes and its borders, and saves lives instead. Gianfranco Rosi has shown this solidarity to a greater audience. In the movie, doctor Pietro Bartolo explains: after seeing so many dead people, and after so many postmortem, his colleagues ask him whether he’s gotten used to it. “How can you possibly get used to it,” he answers. It’s impossibile when you have seen the faces, the eyes, when you have heard the stories of those who flee from war and poverty. The only way to get used to so much suffering is to close your eyes or look away. I thanked Rosi once again for Fuocoammare: only if we tell the story of Lampedusa, and what happens there, can we make Europe aware and build a shared European sentiment. There is no other way to show that nothing is worth a human life. There is no other way to explain – as the doctor does – that “helping these people is a duty for each man who truly is a man.” Everyone has to contribute, with their own means and taking their own responsibilities. From Europe’s southern border to the far north. This morning, after the College of Commissioners, together with my Maltese colleague Karmenu Vella I presented our Joint Communication on the Arctic. It might sound strange for an Italian and a Maltese to introduce the Union’s policies for the Arctic: in fact, it shows that what happens above the polar circle concerns the whole of us, not just the northernmost countries in Europe. 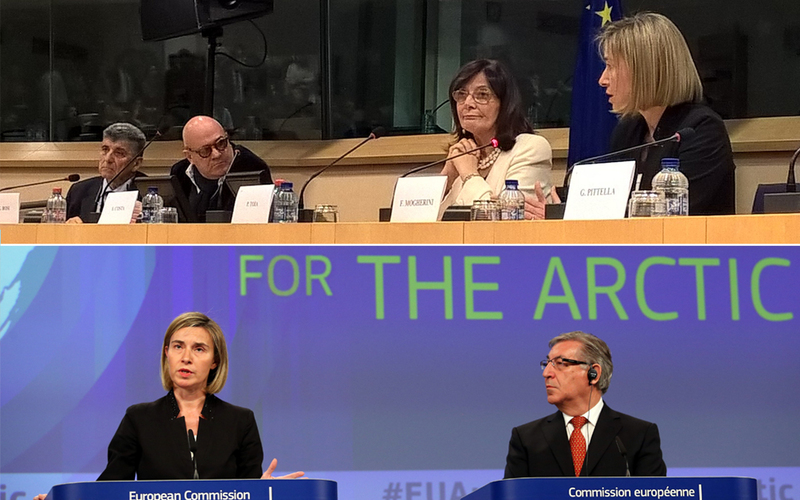 For the first time the Commission deals with the Arctic in so much depth: from the fight against climate change to maritime security, from sustainable development to the new routes between Europe and Asia. But the Arctic is also strategic for our security and for regional and global dynamics. Three continents and three world powers – the US, Russia and our Europe – front on to this region, and other powers like China are increasingly interested in it. Europe will work to preserve and strengthen international cooperation on Arctic issue, with a direct involvement of our Union. It is our strategic interest, a responsibility we cannot ignore.